Two police officers escaped unharmed after their patrol car burst into flames while responding to a 999 call. 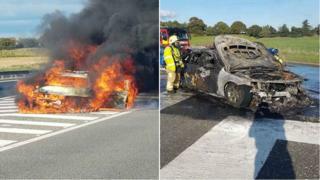 The BMW caught fire on the A168 at Asenby near Topcliffe just after 17:30 BST on Saturday as officers were on their way to reports of a collision. Sgt Paul Cording, from North Yorkshire Police, said the car "suffered a catastrophic engine failure". The officers were not injured and returned to work hours later in a replacement vehicle. Sgt Paul Cording tweeted: "Lucky escape for my colleagues on the A168 at Asenby when their patrol car suffered a catastrophic engine failure on a blue light run." Fire crews from Thirsk and Ripon put out the blaze.